Very Good. 1406347167 Very Good Condition. Has some wear. Five star seller-Buy with confidence! Fair. 0763662623 Item in acceptable condition including possible liquid damage. As well, answers may be filled in. Lastly, may be missing components, e.g. missing DVDs, CDs, Access Code, etc. This book was recommended to me for my 11 year old daughter. She is an avid reader, and is running out of books to read. I pre-read it and decided not to give it to her. I understand that the premise of the book is that the foul mouthed, un-enlightened conversations of the characters are the result of their intellect being stolen from them through mind control, and that our goal should not be to emulate these characters. However, I felt that my daughter wasn't at a maturity level to be able to dissect that message from the book. She may be ready for this book in a few years. I prefer Orwell's 1984, or Bradbury's Farenheit 451 to this book, and if she reads Feed, I will get those other books in her hands soon afterwards. I understand that I am from an older generation, so I would be okay with this book being an entry point into the genre. The book has many similarities to our media saturated pop-culture. It should provide fodder for great conversations for parents and kids. Perhaps the most impressive thing about M.T. 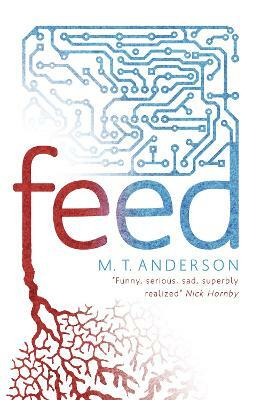 Anderson's 'Feed' is the author's ability to write in a teenager's voice. The slang used in the book is often hard to get around, but it always makes sense--in context. Some ideas in the book may not be explained to every reader's tastes, but we must realize that the narrator, since he is a teenager in a very futuristic world which is much altered from our own, does not--should not--feel the "need" to describe everything that he thinks everyone should already know. The main character is more than a character--he is human with human problems, feelings, disappointments, and embarassments. If we don't necessarily love this character, we might at least come away feeling like he's more like ourselves than we thought. An often chilling criticism of our increasingly wired culture, 'Feed' may be the cautionary tale we all need.